The ability to read a chord symbol and name the pitches of its chord is an essential skill for all musicians. I use it constantly in all of my music theory, analysis and orchestration courses to quickly describe musical harmony while dispensing of the need to suss out harmony from a written-out texture. It is, of course, also the foundation of jazz and pop improvisation. Students of classical music often do not learn how to interpret these symbols beyond plain triads, so I am providing this lesson as an introduction for those students. A capital letter indicates the chord root. A capital letter all by itself indicates a major triad (C = C major, B♭ = B-flat major, and so forth). Major triads can also be indicated by a capital letter followed by a capital “M” (CM = C Major, B♭M = B-flat Major). A capital letter followed by a lower-case “m” indicates a minor triad (Cm = C minor; F♯m = F-sharp minor). Sometimes both letters are lower-case (cm, f♯m, etc. ), and infrequently, the lower-case “m” is left off, using a lower-case chord-root to indicate a minor chord (c = C minor); this will not be used in this course. In some jazz charts, the “minus” symbol (-) indicates a minor triad (C- = C minor); this will also not be used in this course. A capital letter followed by a ° or + symbol indicates diminished and augmented triads, respectively (B° = B diminished, G+ = augmented). Sometimes, instead of the ° and + symbols, the abbreviations “dim” and “aug” will be found (Bdim or Gaug). A pitch name followed by “7” indicates a dominant seventh (major triad with minor seventh) chord, no matter its role in the key. A pitch name followed by M7 or Δ7 indicates a major seventh (major triad with major seventh) chord. A pitch name followed by m7 or min7 (or -7) indicates a minor seventh (minor triad with minor seventh) chord. By combining the “m” and “Δ” symbols, a minor/major chord (minor triad with major seventh) is indicated. A pitch name followed by ø7 or halfdim7 indicates a half-diminished seventh (diminished triad with minor seventh) chord (there is another way to show this that is explained below under “inverted chords”). A pitch name followed by °7 or dim7 indicates a fully-diminished seventh (diminished triad with diminished seventh) chord. Augmented triads can also have sevenths added. aug7 or (+7) chords are augmented triads with a minor seventh over the root, like a dom7 with raised fifth. augΔ7 indicates an augmented triads with a major seventh over the root. All other chords described here are formed by stacking thirds: a root note, a third above that (the “third”), a third above that (the “fifth”), a third above that (the “seventh”), and so on. “Sus” and “add” chords are different. The sus4 chord is formed when the fourth above the root replaces the third; the sus2 chord is formed when the second above the root replaces the third. These chords are neither major nor minor — it’s as if the chord is frozen in a moment that a 4-3 suspension or 2-3 retardation is occurring (the suspension may or may not resolve). An add2 chord adds a note a second above the root to the triad. The difference between sus or add chords and extended chords (see below) is that extended chords tend to have a seventh as a matter of course. Sus and add chords do not. Sometimes a slash ( / ) followed by a pitch-name is added to the chord symbol, indicating its inversion. This has nothing to do with secondary dominant chords, which also use a slash (as in “V7/V”) for a very different purpose. For chords in inversion, the symbol to the left of the slash indicates a whole chord and the pitch-name to the right of the slash indicates the chord’s lowest note. If there is no slash, the chord is assumed to be in root position. C/E = C major triad in first inversion (E is its lowest pitch). F♯m7/E = F♯ minor seventh chord in third inversion (E is its lowest pitch). The pitch that follows the slash is almost always a member of the chord, but sometimes musicians play “fast and loose” with the use of this notation in pop and rock music. For instance, the symbol Fm/D might be used to indicate a Dø7 chord, or F/G might be used for a G9sus4 chord (see below for how to interpret “extended chords”). We call them “ninths,” “elevenths” and “thirteenths” regardless of the octave in which they are found. “Ninths” are like seconds (a 9th is one octave larger than a second), “elevenths” are like fourths (an 11th is one octave larger than a fourth) and “thirteenths” are like sixths (a 13th is one octave larger than a sixth). Not all chord members may be present in an extended chord; most often, some chord tones are omitted. To avoid having extremely thick chords of six or seven notes, it is common to leave out the fifth, the second-highest chord member, or even the root. The highest number is the only one used; in a D♭11 chord, it is assumed that there is a seventh or ninth, but no 13th. Extended chords are named like seventh chords, but the highest chord member is substituted for the number 7. For instance, a C9 chord is a dominant seventh chord with a major 9th added; its pitches are C-E-G-B♭-D. A Bm13 chord is a minor seventh chord with major 13th (an possibly major 9th and/or perfect 11th) added; its pitches are B-D-F♯-A-C♯-E-G♯ because B-D-F♯-A forms a minor 7th chord, C♯ is a major 9th above B, E is a perfect 11th above B, and G♯ is a major 13th above B. What are the pitches that make up each of these chords? What would you call this four voice chord? I know what I call it, but I want to read it from you. First of all, it makes no difference if the chord is played on a guitar or any other instrument – it would be the same chord regardless. You’ve spelled a Gaug7. [original comment has been edited] My jazz-centric friends think the chord is a flat-13. Are they wrong? I think you may both be right, and outside of any musical context it might be too small a detail to argue over. You are right that the chord has no 9th or 11th, and that’s why I told you it was spelled as a Gaug7. If the D-sharp was spelled as an A-flat, you would have spelled a flat-13 chord. It’s very common for 13th chords to omit lower-level extensions (the 11th and 9th), and they still come across with pretty much the same sonic quality. Some factors need established before a “name” can be given to a sound. Adam is correct a D#/Eb are enharmonic equivalents. Let a chord’s place in a progression dictate what to describe it as. What went before and what comes next. Used as a passing chord in a progression if if the given harmony line is rising to the note then it is being sharpened so D# applies. If the harmony line is descending then Eb applies. There is a difference between chord “name” (G7, Cm, etc.) and it’s function (“passing chord” or Roman numeral designation, etc.). It’s true that enharmonic spelling of names (F#7 vs. Gb7, or even the complicated use of dim7 chords (F#dim7 has the same sound as Adim7, for instance) is chosen by a chord’s function, but that does not affect the naming of a chord according to the spelling of its notes. I’ve come across an Ab6/9 chord. I assume since the 9 is written the same size as the 6 (small and upperhand), the whole chord is not supposed to be over the ninth (and they would probably have written it over Bb if that was intended). Where do I place the 6 and the 9 in the chord structure? I imagine the chord you’re seeing isn’t using the slash to indicate inversion (that’s something associated with letters, like A7/G). It’s probably supposed to be an Ab Major triad with added sixth (F) and ninth (Bb), but no seventh or eleventh. The chord would be spelled Ab-Bb-C-Eb-F. Your page on how to read chord notations was exactly what I wanted. Thank you for making it available online. I don’t entirely agree with you about the use of slash chords. It’s true that “F/G might be used for a G9sus4 chord”, but normally only in a jazz context. To most rock and pop musicians F/G would be interpreted more strictly / literally as an F major triad played over a G tone. That is, G F A and C only. A G9sus4 chord would also have a D in it, which would change the tonality of the slash chord, and may well have been deliberately left out. In short, if you’re a jazzer and know what you’re trying to achieve, play G9sus4. Otherwise, don’t! Is there a specific notation to indicate that a note is to be omitted from a chord, such as a G7 with the D omitted, or would that make it a different chord? That wouldn’t usually be shown in a chord symbol, but if you need to be specific about something like that, you could add it to the chord alteration like so: G7(omit5). For the first question of the second part of the practice, could Dbdim7/E also be an acceptable answer? because its the same thing as an Edim7 chord I think. It’s not quite the same thing, but the sound is the same. If D-flat were the chord root, it would be spelled D flat – F flat – A double-flat – C double-flat… a strange chord spelling to say the least. The appropriate chord root id determined by the key. For instance, Edim7 would be the chord built on the seventh scale-step of F Minor. 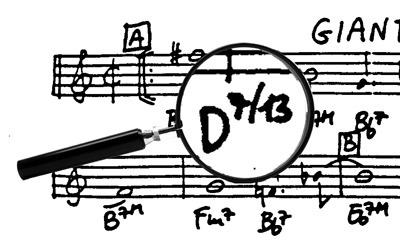 Db dim7 would (hypothetically) be the chord built on the seventh scale-step of E-double-flat minor (hypothetically because that’s not really a key anyone would use). There is one more use for a chord lie Dbdim7, though — it could be a “common tone seventh chord” that embellished a Db Major chord. D F sharp A C E flat G sharp……by my “iffy” reckoning. Is it all necessary? Is it a bit pedantic? What can I leave out? Exactly right! You can leave out the A to thin the chord – leave out the D, too, if you are playing with a bassist who is covering the chord roots. I’m late to this party. Good page. Going through the “Try it yourself” section, it appears answers 12. and 13. contain extra “pitches” than what is queried by the chord name. With regard to Mark Luce’s question of what he might write on a chart to produce the specific chord sound he’s looking for, as a guitar player, G7b13, would do it for me. The pitches are as-written because it is common practice to assume all chord members lower that the highest one written. For instance, an 11th chord will likely contain a 7 & a 9th, and so forth. Complicating things further, chords may often be incomplete, so an 11th chord may omit the 9th, or even a triad member (the fifth), or even a root (assuming someone else in the band… probably a bassist) will play the root.